Android phones, lovable as they may be, are idiotically named. Crap like Wildfire Incredible Sensation Vigor Touch Skyrocket Z E Pro taint otherwise decent phones. Where do Android phone makers come up with this stuff? Why from condoms! 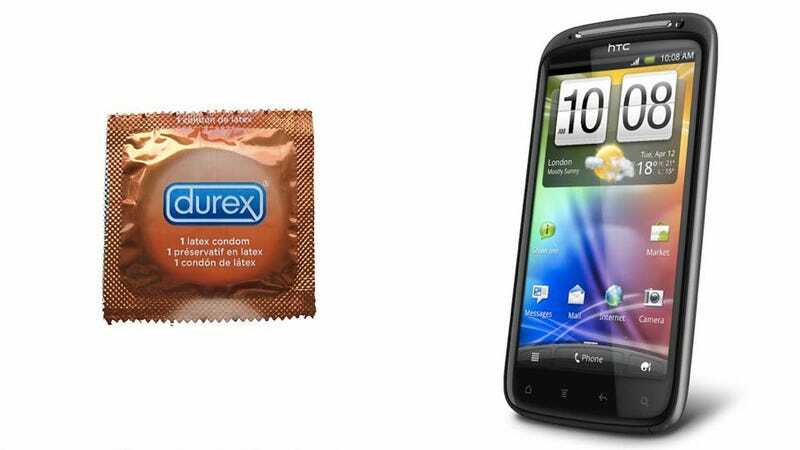 Turns out, condoms and Android phones share more than just intimate utility, they're actually named the same too. Check out the list from the Intercom Blog, who hilariously cooked up a graph of Android phones and condoms that use the same silly and pointless name. There are so many similarities that you half expect an Ultra Thin Android phone or a Rezound condom. But seriously, people who make condoms and/or Android phones, no one buys your condom or Android phone for the name. In fact, your naming pattern probably confuses the heck out of people. A Her Pleasure Trojan XL Extra Thin Super Orgasmic Purple Flavored Condom is just a condom. A Hero Optimus Amaze Droid Galaxy Captivate Orange Fascinate Android phone is just an Android phone.